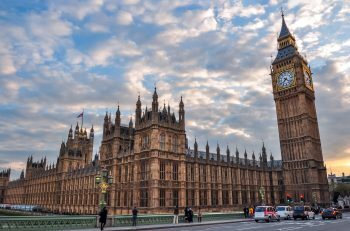 UK politics is strained, tense and uncertain as the clock counts down to the UK’s exit form the European Union on 29 March, 2019. This can translate into volatility on the financial markets, which is unsettling for investors. Here are some key tips to navigating this uncertainty without losing sight of your goals. Now, as unsettling as fluctuations in prices can be, volatility is a normal function of the financial markets. But, it’s often misunderstood which can lead to investors make the wrong decisions at the wrong time. Market volatility measures how much a price moves over a period of time. If an asset’s price moves dramatically over a short time-frame, this is a period of high volatility. Low volatility indicates the price of an investment will be relatively stable. Calculated in percentage points, you can measure volatility either through the standard deviation, or by comparing the volatility of an investment’s returns against the relevant benchmark. Fluctuations on the financial market is crucial to give investors the opportunities to maximise their return, or grow their money at all. As unnerving as it can be to see your portfolio fall in value, volatility is normal – even in one of the longest bull markets on record. Just look at the chart from JP Morgan below; it shows that the S&P 500 falls by 5% around once a quarter, with a drop of 10% likely to happen once a year. Historically, the index falls 20% just once per market cycle. Volatility is uncomfortable for investors over the short-term. If your investment portfolio isn’t built to reflect your risk profile and time horizon, this can make you feel backed into a corner. It’s easy to make knee-jerk and irrational decisions that go against your investment goals when feeling under pressure, but this means many investors end up selling their assets at the wrong time, and end up losing money. When you invest you want to ‘buy low, sell high’, but by trying to time the short-term market, many investors end up doing the opposite; buying high, and selling low. You can easily miss the best days of performance on the market by trying to avoid the worst. Historical data from JP Morgan shows that financial markets usually rally after a short-term volatility. Although markets can suffer from what seems like a severe sell-off within a calendar year, this usually reverses with the market growing by the end of the six months. The chart below reflects the performance of the S&P 500 in the 37 years to 2016. On average, the S&P 500 suffers an intra-year fall of 14.2% each year. Despite this average double-digit slip, the index still end the year higher than it began 76% of the time. Of course, the average inter-year fall will be skewed by significant sell-offs in 2008 and when the tech bubble burst in the early 2000s, but this chart shows market noise and investor response doesn’t always reflect a dislocated economic backdrop and disjointed financial market fundamentals. As the best and worst days in the market are usually clustered around the same time, it’s easy to miss the best days of performance by trying to avoid the worst. But does this really have a big impact on your portfolio when investing for the long-term? 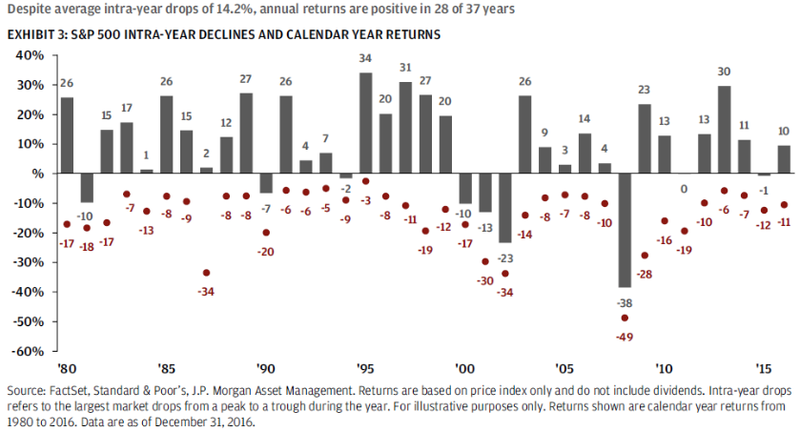 The chart below from JP Morgan shows just how much missing the best days of performance can impact your portfolio. If you’d invested $10,000 on 1 January 1997 and left it tracking the S&P 500 until the 30 December 2016, your portfolio would be worth $43,933, nearly double the $21,925 you would have if you missed just the 10 best days in the market. 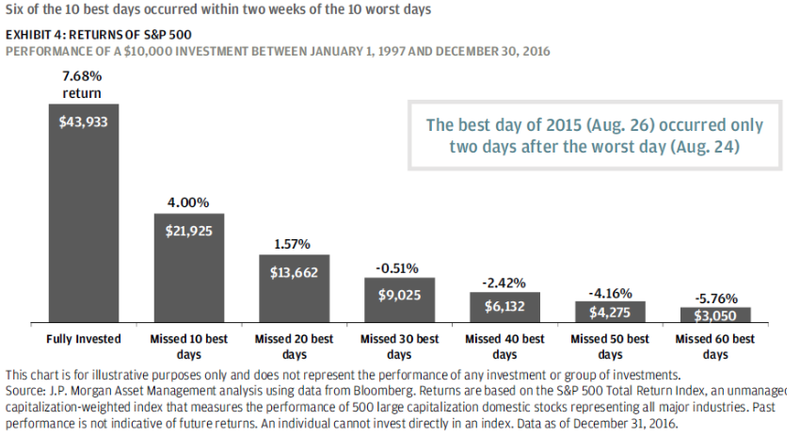 The JP Morgan research shows that the best days occur within two weeks of the 10 worst days of the market. Those who sold to avoid losing money would also likely have missed a big rebound. This relationship between the best and worst days of performance is good to remember as we enter a period fraught with economic uncertainty. When it comes to investing during market volatility, it’s time in the market not timing that helps maximise returns over the long run. There is a simple strategy for those looking to make the most of opportunities during market volatility. Setting up a monthly direct debit can help average out the price you pay for an asset over time. During periods of volatility, this can actually lower the price you pay for an asset. The less you pay for an investment, the less it has to grow for you to make a profit. A monthly direct debit also takes the emotion out of investing. It can be difficult to ignore market noise when investing, but we’ve already seen that timing the market and missing the best days of performance can hinder your returns over the long run. By setting up a direct debit, you don’t have to remember to invest when it comes to pay day each month. This hassle-free feature means you can focus on the important things in life, knowing we’re looking after your future. Whether it’s because you are too busy, don’t have the interest or lack the financial knowledge, investment advice helps you make better decisions with your money when growing it for the future. Many investors look for the elusive edge when investing to make their money grow, when all they really need is time. As discussed above, volatility is normal and investors should expect the financial markets to rise and fall over a given period of time. When you’re investing for the long-term this doesn’t matter. You can take on a lot of risk safe in the knowledge that you have the time to ride out any short-term fluctuations and benefit from any recovery. When you’re investing for the short-term, this volatility means lost money as the amount of time you have for your investments to recover is limited. Whilst you don’t actually crystallise any losses until you hit the sell button, you could be forced to sell for a lower price than you would like if you need your money immediately. That’s why it’s important you take into account your time horizon before you start investing. If you want your money back in 12-24 months, it might be more appropriate to keep your money in a cash ISA. If your goals are five years away, for example, investing in the financial markets could be for you. If you’ve got a long-term horizon, investing can help maximise your returns and help you reach your goals quicker. When building your portfolio, you want to manage risk in the most cost-efficient way. One of the best ways to do this is through diversification. In a diversified portfolio, any fall in one asset class should be offset by better performance in another. Whilst evidence suggests that it’s difficult for active stock pickers to consistently outperform the market over time, a diversified portfolio is typically better insulated against downside risk. At Moneyfarm, we believe a diversified portfolio is likely to create the best outcomes for our investors and our portfolios typically hold seven-14 exchange traded funds (ETFs), which are diversified by their very nature, spread across geographies and asset classes. Investing in a broad range of investments, assets classes and geographies might seem simple enough, but getting the right mix to help you reach your goals can be difficult. That’s why our customers rely on our experienced team. Investing takes time, knowledge and skill to do successfully, and it can be a lot of responsibility when managing your family’s money for the future. That’s why many investors prefer the experts to do it for them. Moneyfarm’s experienced investment team build and manage the investment portfolios for our investors to ensure they reflect our investor profiles. The Moneyfarm portfolios use Exchange Traded Funds to keep costs low. Whilst we use passive instruments to build our portfolios, the investment team has an active management style. Headed-up by Chief Investment Officer Richard Flax, the team of portfolio managers monitor the markets daily and make changes to portfolios when they see good opportunities. Sometimes the best course of action is to do nothing at all. Understanding that they are managing your money for a more financially secure future, the investment team work hard to ensure your portfolio reflects your investor risk profile, and that you’re in the best position to reach your goals.